RIP "Dickie" Neighbors • View topic - Richard Harris Bluegrass "Ruby Cue"
Richard Harris Bluegrass "Ruby Cue"
Post subject: Richard Harris Bluegrass "Ruby Cue"
Here is a very interesting cue. 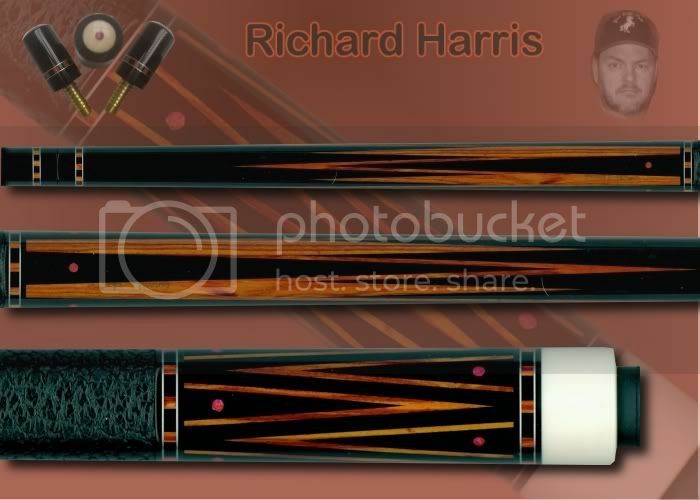 I fell in love with this cue when Richard delivered it to Jack Lee. I play most of my pool in Jack's room and he is Richard's largest dealer. I would say approx 50% of Richard's cues out there have gone through Jack's hands at one time or another. There is a total of 18 Red Rubys with 15 in the points and 3 in the JP's.